Ana Tramel is a lawyer with a dark past who has reached the lowest point in her career. Years before, she was a brilliant barrister specializing in important media cases, taken on by the city’s best firms. She now spends her days between administrative resources in a mediocre buffet, anaesthetising her emotions in a glass of whiskey. One morning, still recovering from a habitual hangover, Ana receives a call from the past. Her brother Alejandro, with whom she hasn’t spoken for five years, calls from the station of the Spanish Civil Guard in Torreledones. He has been arrested for the murder of the director of the Castilla Grande Casino and he desperately asks for her help. Although she has been out of the practice for ages she is the only person he can trust. During the investigation to prepare the defence she discovers a number of things: The first is that the crime has been recorded on the Casino’s closed-circuit television. Secondly, Alejandro had gambling debts of almost eight hundred thousand euros. And thirdly, her brother is a box of surprises; as well as being a compulsive gambler and a murderer, he has a two-year-old son. In ANA nothing is what it seems. Not one of the characters is exactly a saint. And as Patricia Highsmith said of one of her stories ‘they are going to see a woman do what no male protagonist in literature of the past forty years would dare: behave with compassion, heroism and expose her body and soul to humiliation’. Roberto Santiago is a writer, playwright and film director. He has written over twenty novels for children and young adults. Among others, the collection Los futbolísimos (‘Footballisms’) (Editorial SM), which has become the best selling saga of children’s literature in Spain in recent years and has been translated into many languages. He has written and directed, among others, the films El penalti más largo del mundo (The Longest Penalty Shot In The World) (nominated for a Goya for best screenplay), El club de los suicidas (The Suicide Club), Al final del camino (‘At The End Of The Road’) and the international co-production El sueño de Iván (Ivan’s Dream). For theatre he has written the adaptations of Ocho apellidos vascos (‘Eight Basque Surnames’), El otro lado de la cama (The other side of the bed) and Per­versiones sexuales en Chicago (Sexual Perversity in Chicago)by David Mamet, among others. He has participated in a number of television series, is professor at the Official Cinema School in Madrid, and his short film Ruleta (‘Roulette’) was the first Spanish short to compete in the Official Section of the Cannes Film Festival. 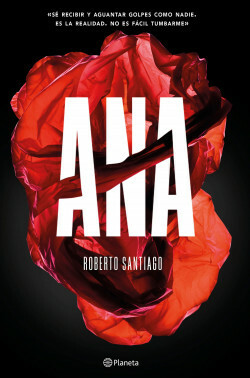 Ana is his first novel for adults.